Oasis' new album - Dig Out Your Soul. As we know already, we all have our different reasons why we love The Brilliant Green, and if like me one of those reasons is their Britrock element, I think there is a good chance you will like this album. In some cases we can draw obvious musical comparisons between Buriguri and Oasis, even if this is not the case vocally and lyrically, and listening to Dig Out Your Soul for the first time just made me realize how much I would kill for a new Buriguri studio album. For me Dig Out Your Soul just storms into life with the opening song ‘Bag It Up’, which has to be my favourite, and as this song ends, I cannot help being reminded of the end to TBG’s ‘HIDOI Ame’. Despite me not buying an Oasis album since (Whats the Story) Morning Glory? in 1995, I believe this is a real return to form for the Manchester band. Anyway, in conclusion, if you are a fan of Britrock, and Los Angeles is your fave TBG album, there is a chance you will like this album, so give it a try. Re: Oasis' new album - Dig Out Your Soul. Cool! Thanks mika. Strange to hear Oasis doing the song for a Japanese film, would be great if Buriguri did music for a western movie . This films looks quite good! Glad to see you posting this thread here, 'cos I'm a big Oasis fan since I know British music. From the first track "Bag It Up", a raw Rock 'n' Roll opening, it truly surprised me, I used to be listen Oasis everyday, it was years ago. After "The Masterplan" album, their songs is getting worst and worst, I admit what I love is the past Oasis. However, I can say I love them again. The second track is one of my favourites too, especially the outro of the song, I think it is tribute to The Beatles's "Dear Prudence". There are some retro style tracks "Waitng for the Rapture", "High Horse Lady", groove beat and sung by Noel(I like every songs Noel is vocal LOL). And the track at the end "Nature of Reality", I love the lyrics, talikng about no such god & devil things exist, just your own mind imagination. Totally it's the top album beside their two first's. I buy the player magazine every month. I read their interviews. They are great. 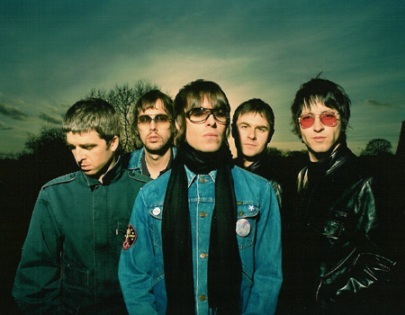 EchoLawrence wrote: Glad to see you posting this thread here, 'cos I'm a big Oasis fan since I know British music. groove beat and sung by Noel(I like every songs Noel is vocal LOL). And the track at the end "Nature of Reality", I love the lyrics, talikng about no such god & devil things exist, just your own mind imagination.